Merry Christmas, Happy Holidays and Happy Hanukkah! I love the Christmas season. Once October starts and fall is in the air, I get excited for the holiday season. This time of year is so busy and there is so much to do. I went out to do a little Christmas shopping in a quaint area of a local town in our area. 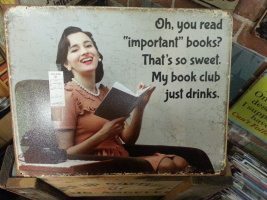 Wandering through one of the antique stores, I stumbled on this perfect sign that fits most book clubs. I thought I would share it with you, hoping it makes you laugh a little. Our book club doesn’t read a book between November and December. We get together in December just to enjoy each other’s company at our annual Christmas party. We take a wrapped book to the party for our gift exchange. The book can be a white elephant book, one that has been gathering dust on our shelves or a favorite book we have read throughout the year. The evening is so much fun. I love not having a book to read for December, it gives me the opportunity to read something off of my own personal reading list. I devoured one book, A Girl in the Dumpster by Jack Apfel, then came The Perfect Life by Danielle Steel and have just started another, Mr. Penumbra’s 24 Hour Bookstore by Robin Sloan. Once the holidays are over I will see you back here to chat about A Girl in the Dumpster and the other’s I have read. I’m anxious to share them with you. Living in So. California we don’t get much rain or any real weather to speak of. But….our weather forcast for tomorrow and early next week is for rain and more rain. We need it badly, so I’m grateful for the freshness in the air. I can hardly wait to turn on the Christmas tree lights, light a Christmas scented candle, get myself a cup of Gingerbread tea and curl up with my Kindle to watch it rain and read. I hope you can take some time out of your crazy schedules to curl up with a good book. Please share what you are reading, I’m always looking for something new to add to my list. Wishing you the same. May you have a beautiful holiday season. Let me know what you’ll Bee Readin.